Cardiac care services through "The Wockhardt Cardiac Line." Another chapter in the history of heart surgery across the world was written in India by the Bangalore-based Wockhardt Hospital & Heart Institute, recently. Dr Vivek Jawali, chief cardiovascular surgeon along with his team at Wockhardt Heart Institute have set a global benchmark by performing the first coronary bypass surgery along with an aortic valve replacement without using general anaesthesia or ventilator support while the patient was on a heart lung machine. This is the first such reported case in the world of a twin heart surgery, the only other being a routine coronary bypass surgery on a heart lung machine. "This patient had multifaceted medical complications, required a bypass surgery and an aortic valve replacement. His lung condition did not permit the use of a ventilator and he was high risk for general anaesthesia. With his surgery being rejected at various centres before he came to us, his best chance of survival was an open heart surgery without general anaesthesia, in other words, an awake heart surgery. We give him that chance using the technique of high thoracic epidural analgesia and a new direction in heart surgery has been unveiled," recounted Dr Jawali. The technique of high thoracic epidural analgesia is a highly precision based methodology which involves injection of micro doses of local anaesthetic in the epidural space around the spinal cord which anaesthetises only the chest region while the rest of the system is fully awake. This enables a painless chest surgery and makes the surgery safe for patients who are high risk for general anaesthesia. Besides the team at Wockhardt Heart Institute in India, Dr Aybek in West Germany has been doing same pioneering in Europe with this technique in heart surgery. "Heart operations where the patient is awake without general anaesthesia or respiratory assistance was until now limited to beating heart bypass surgeries only. The associated valve replacement throws open the doors of surgery for many patients (many in their most productive years) who are termed inoperable," explained Dr Jawali. Dr Vivek Jawali and Dr Murali Chakravarthy, chief cardiac anaesthetist of Wockhardt Heart Institute are the national pioneers of awake coronary bypass surgery on beating heart through full chest incisions and over the last two years have performed 255 awake heart surgeries and have six international publications on this topic in the leading journals of the world to their credit. It was one of the most critical decisions George Marshall faced in his life. The 73-year-old violin repairer from Bradford, UK, suffering from severe angina (chest pain), was told by his local doctor that he had a choice of waiting for six months for a heart bypass operation on the National Health Service (NHS) or pay 19,000 sterling pounds for the same operation at a private hospital in Britain. Marshall met a fellow Briton, Ian Stanley Brown, who had earlier undergone a coronary angioplasty by Consultant Cardiologist Dr. Ranganath Nayak at the Wockhardt Hospital & Heart Institute (WHHI). And after an email chat with Wockhardt Hospitals' Vishal Bali, he took the bold decision to fly 5,000 miles to WHHI in Bangalore. A hale and hearty Marshall was discharged on 9th February after a successful double bypass surgery performed by Dr. Vivek Jawali, the hospital's chief cardiovascular surgeon. A piece of artery was taken from Marshall's arm to bypass the blocks in the arteries of his heart. "Everybody's been great here and my stay has been pretty relaxing. 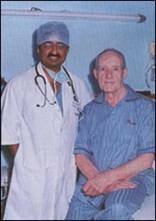 I have been in the NHS and gone private in Britain in the past, but I can say that the care and facilities in India are easily comparable," Marshall told UK newspaper Guardian from his hospital bed after his surgery. "I'd have had no problem coming again." It cost him only 4,800 sterling pounds, and that included the cost of his flight from UK to India and back. He is now back home with his family and friends. Marshall is the latest in a list of patients from Europe who hay, placed their trust in Wockhardt and India, and are spreading the good work back home. Wockhardt Hospitals has shown that innovation and excellence in science and technology are no longer the exclusive preserve of the West. "A Rare Cancerous Tumor involving major blood vessels was successfully removed from a 19 Year Old Girl at Wockhardt Hospitals Bangalore"
Bangalore, February 12, 2009 : - A team of 10 doctors at Wockhardt Hospitals Bangalore led by Dr. Shabeer Ahmed, Minimal Access Surgeon, Wockhardt Hospitals, successfully removed a cancerous tumor involving the abdominal aorta of a 19 year old girl, after a 7 hour long surgery. Saleema (name changed) traveled all the way from Jaipur to undergo the surgery at Wockhardt Hospitals to remove Primitive Neuroectodermal Tumour (PNET), a tumor that originates in cells from the Primitive Neural Crest. This cancerous tumor which involving abdominal aorta is a rare case in the medical history and there have been no reports found on such a rare tumor in the medical literature (reference - Cochrane Library -an international medical library, a collection of databases in medicine and other healthcare specialties provided by the Cochrane Collaboration and other organizations). Before coming to Wockhardt Hospitals, Saleema had visited a city hospital in her hometown Jaipur where she was advised to undergo a surgery without prior tissue diagnosis and down staging chemotherapy. To reconfirm the reports and to get a super specialist's opinion of the case her parents consulted Dr. Shabeer Ahmed at Wockhardt Hospitals Bangalore. Saleema was reevaluated and a needle biopsy using CAT scan confirmed the tumour to be a 23 centimetre long PNET. Immediate Chemotherapy was commenced on her to reduce the size of the tumor and at the time of the surgery the size of the cancerous tumor had come down to 8 cm. According to Dr. Shabeer Ahmed, Minimal Access Surgeon, Wockhardt Hospitals, "Most PNET's occurs in the brain, extremities, pelvis, chest wall and mediastinum. This is the first quoted instance where a PNET was found in the abdomen involving the Bifurcation Abdominal Aorta. Surgical removal is usually a big challenge and it becomes more when it involves big vessels like the aorta - the big vessel which carries purified blood from heart to other organs." During the surgery it was observed that the tumor had spread through the left-ureter, common aorta, bifurcation and the tumor was excised en-bloc along with the aorta. Saleema had a speedy recovery after the surgery and was discharged on the 7th day. However she is still undergoing chemotherapy to kill other cancer cells, if any present in other parts of her body. This kind of a case involves a vascular surgeon, urologists, intensivist and the hospital I equipped with clinical strength to perform such complex surgeries. WebMD Medical News - High Costs in US Driving Patients to Seek Treatment in India - By Rick Ansorge, WebMD Medical News Oct. 18, 2006 -- Dismayed by high surgical costs in the U.S., increasing numbers of American patients are packing their bags to have necessary surgery performed in countries such as India, Thailand, and Singapore. "This is not what is sometimes snootily referred to as 'medical tourism,' in which people go abroad for elective plastic surgery," says Mark D. Smith, MD, MBA, president and chief executive officer of the California HealthCare Foundation in Oakland. Today's "medical refugees," the term Smith uses in an article published in the Oct. 19 issue of The New England Journal of Medicine, are going to foreign countries for lifesaving procedures such as coronary bypass surgery and heart valve replacement, and also life-enhancing procedures such as hip and knee replacement knee replacement. "People are desperate," Smith tells WebMD. "This illustrates the growing unaffordability of the U.S. health care system, even to people who are by no means indigent." The report by Smith and his colleague, Arnold Milstein, MD, MPH, documents the case of a self-employed carpenter who couldn't afford private health insurance and would have faced financial ruin if he had surgery in the U.S. It also shows how some insured workers are being steered toward receiving less-expensive procedures outside the U.S.
Vishal Bali, chief executive officer of the Wockhardt Hospitals Group in Mumbai, India, says there has been a 45% increase in the number of American patients seeking care at his 10 Indian hospitals during the past two years. "Cost is a major factor," Bali tells WebMD. Some examples: Wockhardt Hospitals usually charge $6,000-$8,000 for coronary bypass surgery, $6,500 for a joint replacement, and $6,500 for a hip resurfacing, which represent a small fraction of the typical costs at U.S. hospitals. "Another major factor is what we call 'the Indian advantage,'" Bali says. "At some point, most American patients have been treated by an Indian physician in the United States and they have tremendous faith in Indian clinicians." Partly because of the influx of foreign patients, not all of them American, Bali plans to open 10 new hospitals in India during the next two to three years. "Our American patients don't just pack their bags and fly to India," Bali says. "They have multiple conversations with patient coordinators and clinicians, many of whom have been trained in the U.S. and have American board certifications." All Wockhardt Hospitals are accredited by the international affiliate of the Joint Commission on Accreditation of Healthcare Organizations, the group which accredits U.S. hospitals, Bali says. More than 80 hospitals in India, Thailand, Singapore, China, Saudi Arabia, and other countries have received this accreditation, according to the new report. "These institutions are reporting gross mortality rates of less than 1%," Smith says. "I'm unaware of any evidence that surgery at these institutions is less safe or of lower quality than that in the average American institution, and there's some reason to believe it may be better." "The downside, however, is that if you are harmed in an Indian hospital, you have less legal recourse than if you harmed at an American hospital," Smith says. To compete with less-expensive offshore hospitals, the U.S. hospitals should do more to reduce costs, improve efficiency, and increase quality, Smith says. "Regrettably, I fear that some people's response to the offshore trend may be to moan and groan and try to shut it down or engage in scaremongering about quality." "This trend shows that the world is flattening," Smith says. "We're no longer just outsourcing back-office functions such as the reading of X-rays, medical transcription, and billing. Now it's the actual clinical care that can be outsourced." The report concludes that the trend is a "symptom of, not a solution to" America's affordability crisis. "I'm not suggesting it'll ever be the main way people get surgery," Smith says. "But it certainly is a wake-up call. If the cost of surgery continues to go up, particularly in settings where there's no relationship between cost and quality, this trend will continue." Bali believes the trend represents a sea change in global health care economics. "This is only the beginning," he says. "This trend is not going to reverse. It's as strong a trend as the outsourcing of information technology because it is advantageous for patients." Although most of Wockhardt Hospitals' American patients are uninsured, Bali predicts that will change. "Insurance companies are looking at this trend, their own viability, and the need to save money," he says. "They're telling patients that there are international destinations where they can be treated, which may mean paying much lower premiums than they're paying to receive treatment in the U.S."
"The need for American citizens to go abroad for care -- and their willingness to do so - represents a crushing indictment of numerous myths about the U.S. health care system that have gained popular currency in recent years," says Peter Budetti, MD, JD, chairman of the department of health administration and policy at the University of Oklahoma Health Sciences Center. Budetti was not involved in the report. Budetti says the report dispels the myths that foreign systems of universal coverage are so flawed that people in those countries who can afford to do so flock to the U.S. for care; that our health care is the best in the world; that everyone in the U.S. will get the care they need whether they can afford to pay for it or not; and, most telling, that increased consumer cost-sharing will reduce cosmetic or other nonessential care, not medically necessary care. "The profound irony of these myths is a sad commentary on the state of our health care coverage and delivery system," Budetti tells WebMD. "The understandable focus in the past decade or so on improving quality and promoting patient safety may have played a role in distracting us from paying sufficient attention to growing problems with access and equity. Perhaps the emerging sight of Middle America traveling thousands of miles for medical care will spur new attention to the need for universal coverage with adequate benefits in this country."